Rearrange the following words into a well known phrase or saying: pole – a – barge – don’t – with – touch. I picked up the news of Masterseek’s imminent launch from AltSearchEngines. Worth investigating further, I thought, especially as I am always on the lookout for quality business directories. “A new enormous business search engine battles Yahoo! and Google for B2B searches. Masterseek’s global search engine provides quick and free access to, among other things, company profiles, contact information, and descriptions of products and services from more than 45 million companies in 75 countries. …. Behind Masterseek lies nearly 9 years of diligence from Danish and international programmers. This sounded promising so time to put it to the test and indulge in a bit of ego-surfing. My first search on RBA Information Services as a company came up with my own RBA, but gave its location as the US despite the co.uk domain name and contact details clearly stated as being in the UK. A quick email to Masterseek and it was corrected. But then it all went seriously pear shaped. 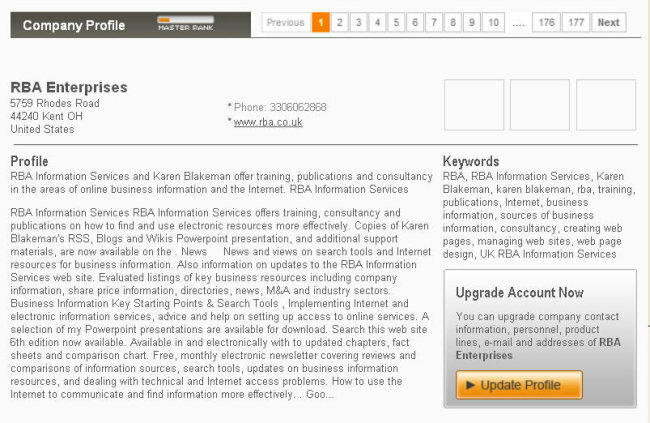 23rd September 2008, 16.48 UK time: search on RBA Information Services and ‘All’ category selected. Results: At the top of the list is a sponsored result for RBA Enterprises based in the US. Nothing to do with me but I am not too bothered as there are thousands of RBAs around the world. However the web site URL was mine and the profile was mine! Numbers 4, 5 and 6 in the results list were for Sources UK (electric cable manufacturers), RBA Enterprises Inc and RBA Internet Services Inc. All three had my web site URL and a profile extracted from my web site. 23rd September 2008, 17.08 UK time: search on RBA Information Services and ‘Company’ category selected. Results: Only two. The first is a ‘sponsored result’ which is me, the correct URL and correct location. The second is identical to the first but the location is given as the United States. 23rd September 2008, 17.15 UK time: search on Karen Blakeman and ‘All’ category selected. Results:The sponsored result at the top of the list was correct. The next four were totally unrelated companies but with my profile and there were another four dotted throughout the remainder of the twenty sites listed on the first page. 23rd September 2008, 17.31 UK time: search on Karen Blakeman and ‘Company’ category selected. Results: Hurrah! I am the only entry. I did a few quick searches on other companies and people and the quality of the results was equally dire. There are additional search and browse options, but I saw no point in investigating them if the underlying data was so horribly wrong. Either the Masterseek “specially developed crawlers” were having a bad day or more serious work needs to be done on processing the information that they gather. Given the current appalling quality of Masterseek’s data Kompass, Thomson and Yellow Pages can rest easy, as can Yahoo and Google. Masterseek’s official global launch is due to take place in November by which time they claim that they will have more than 50 million pieces of company information and more than 1/4 billion indexed websites. Unless they apply more ‘diligence’ to the quality of the information in their database, my recommendation is to avoid this directory like the plague. Internet Librarian International is extending the ‘early bird’ discount for conference bookings to Friday 26 September. Forget the hype – how do they work and how will they affect how you provide information? Do you know how effective your projects are and whether you’re reaching the right audience? Why are some institutions more prone to adopting transparency and collaboration than others? As well as being an RSS junkie I confess that I am also a member of the the ‘twitterazi’. Deprived of my regular Twitter fixes I suffer severe withdrawal symptoms. What is infobunny up to? Did Jillbrad manage to print her spreadsheet? Did Tebbo meet up with anyone at T5? Yes, I’m sorry, this is another Top !0 list from one of my workshops – a full day in-house session on Business Research. This time around Marketingfile.com made a return to the list at number 4 after a long absence, three of Alacra sites are at number 2 (nominated by participants as “All the Alacra sites”), and Twitter is at long last being considered as a serious business tool (Yay!!). It is worth noting that this group were interested in Second Life; some of their contacts and clients are involved with Second Life so it would have been useful to have a look at how it works . As usual, though, we could not connect to SL. It appeared that the ports used by SL were blocked by the by the organisation’s network. 1. Internet Archive or Wayback machine at http://www.archive.org/. For pages, sites and documents that have disappeared. Ideal for tracking down lost documents and seeing how organisations presented themselves on the Web in the past. Alacrawiki at http://www.alacrawiki.com/. The Alacra Spotlights section is a good starting point for evaluated sites and information on industry sectors. Note that although it is a wiki only Alacra can edit these pages. Alacrasearch at http://www.alacra.com/alacrasearch/. A Google custom search engine that focuses on business sites selected by Alacra. AlacraStore at http://www.alacrastore.com/. “Search over 70 million reports on more than 550,000 public companies and private companies from over 55 premium business information publishers.” Search for free and pay as you go on your credit/debit card. A full lost of their content providers is at http://www.alacrastore.com/search-by/publisher. 3. Advanced Search. The advanced search screens of the likes of Google and Yahoo have many options for increasing the precision of your your search: file format (e.g. xls for data and statistics, ppt for expert presentations, pdf for industry or government reports); site and domain search to limit your search to just one web site or a type of organisation (e.g. UK government, US academic); and in Google there is a numeric range search. 4. Marketingfile.com at http://www.marketingfile.com/. A collection of lists with a bias towards UK and Ireland but there are some International, European and North American lists. The lists are divided into Business and Consumer and further categorised into sectors or type, for example Drinks Trade, Aviation & Defence, Smaller Companies. Each list can be searched by a number of criteria depending on its structure and coverage. Searching is free and data is charged for on a pay per record basis. 6. Trade Association Forum – http://www.taforum.org/ . A useful, searchable directory of UK trade associations. The workshop participants commented that “some of the councils are better than others”. 8. Google, Yahoo, Live, Exalead, Ask. Let’s admit it – much of the time we head for Google as our first port of call, but it is worth running your search in the other contenders. Results are sorted in a different order and they do have different coverage and search features. 9. Twitter – http://www.twitter.com/. “Looks interesting”. “Need to try it out as a source of information”. “Could be useful as a promotion/communications tool”. 10. RBA Business Sources. http://www.rba.co.uk/sources/. Selected sources of business information organised by type e.g. statistics, share prices, company registers. Yes, my own site, the basis of the workshop notes, and as one person commented “It is the quickest way to get to all the sites you told us about”!